Oftentimes, emergency crews responding to house fires will come equipped with pet-sized oxygen masks to help out any animals that may have suffered from smoke-inhalation -- but on other occasions they have to improvise. 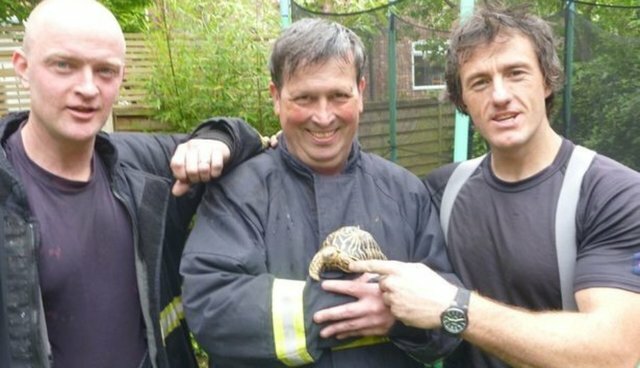 While clearing out a smoke-filled home in Didsbury, England this week, firefighters discovered what looked to be the charred remains of the fire's only victim: a pet tortoise named Enzo who had been stuck in his tank. Although the animal appeared lifeless, firefighter Andrew Cook thought he'd try to save it anyway. Hurrying with Enzo back to the firetruck, Cook then fashioned miniature oxygen tent out of some protective cloth and placed the tortoise inside. "We pumped oxygen in and eventually Enzo started to move," Cook's colleague Mike Dillon told the Manchester Evening News. "Andrew did so well. We always try and save pets but are not really trained to deal with tortoises." Thanks to the firefighter's quick-thinking, it wasn't long before the resuscitated tortoise was back on his feet after the near-death experience, says Dillon. "Soon Enzo was marching around the garden as if nothing had happened."